"If you walk into a cocktail party and say, 'I don't believe that time passes,' everyone's going to think you're completely insane," says Brad Skow, an associate professor of philosophy at MIT. He would know: Skow himself doesn't believe time passes, at least not in the way we often describe it, through metaphorical descriptions in which we say, as he notes, "that time flows like a river, or we move through time the way a ship sails on the sea." Skow doesn't believe time is ever in motion like this. In the first place, he says, time should be regarded as a dimension of spacetime, as relativity theory holds—so it does not pass by us in some way, because spacetime doesn't. Instead, time is part of the uniform larger fabric of the universe, not something moving around inside it. Now in a new book, "Objective Becoming," published by Oxford University Press, Skow details this view, which philosophers call the "block universe" theory of time. In one sense, the block universe theory seems unthreatening to our intuitions: When Skow says time does not pass, he does not believe that nothing ever happens. Events occur, people age, and so on. "Things change," he agrees. However, Skow believes that events do not sail past us and vanish forever; they just exist in different parts of spacetime. (Some physics students who learn to draw diagrams of spacetime may find this view of time intuitive.) Still, Skow's view of time does lead to him to offer some slightly more unusual-sounding conclusions. For instance: We exist in a "temporally scattered" condition, as he writes in the new book. "The block universe theory says you're spread out in time, something like the way you're spread out in space," Skow says. "We're not located at a single time." 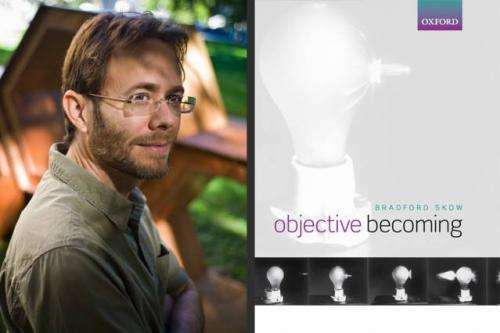 In "Objective Becoming," Skow aims to convince readers that things could hardly be otherwise. To do so, he spends much of the book considering competing ideas about time—the ones that assume time does pass, or move by us in some way. "I was interested in seeing what kind of view of the universe you would have if you took these metaphors about the passage of time very, very seriously," Skow says. In the end, Skow finds these alternatives lacking, including one fairly popular view known as "presentism," which holds that only events and objects in the present can be said to exist—and that Skow thinks defies the physics of spacetime. Skow is more impressed by an alternative idea called the "moving spotlight" theory, which may allow that the past and future exist on a par with the present. However, the theory holds, only one moment at a time is absolutely present, and that moment keeps changing, as if a spotlight were moving over it. This is also consistent with relativity, Skow thinks—but it still treats the present as being too distinct, as if the present were cut from different cloth than the rest of the universal fabric. "I think the theory is fantastic," Skow writes of the moving spotlight idea. "That is, I think it is a fantasy. But I also have a tremendous amount of sympathy for it." After all, the moving spotlight idea does address our sense that there must be something special about the present. "The best argument for the moving spotlight theory focuses on the seemingly incredible nature of what the block universe theory is saying about our experience in time," Skow adds. Still, he says, that argument ultimately "rests on a big confusion about what the block universe theory is saying. Even the block universe theory agrees that … the only experiences I'm having are the ones I'm having now in this room." The experiences you had a year ago or 10 years ago are still just as real, Skow asserts; they're just "inaccessible" because you are now in a different part of spacetime. That may take a chunk of, well, time to digest. But by treating the past, present, and future as materially identical, the theory is consistent with the laws of physics as we understand them. And at MIT, that doesn't sound insane at all. There is no past or future except as directions in which we aim the present. These directions are as diverse as the number of multiverses. The present is a hub where those traveling from and toward disparate universes temporarily unite, perhaps drawn by massive entanglement, and compare notes. Eventually quantum discord separates the united reality into disparate mutually-exclusive branes as new entanglements are sought in a "future"
Ah, philosophers. Need I say more? It doesn't say much for his model when the competing 'models' come from folk psychology rather than science. But let's consider this idea that the past exists somewhere else in spacetime. It means that the mass of the universe exists multiple times, near enough to infinite mass by now. So where does all this extra mass come from? The assumption that time can be described by a time-line as anything more than mathematical convenience is flawed. There is no universal clock. At the speed of light time does not pass at all, but a photon can travel for millions or billions of years by the measure of slower observer. Thus there are many models of time and no universal one. He has chosen one model and attempted to generalise it, thus leading to absurd conclusions. In the physical world, we (eventually) accepted that the world as we see it is largely an illusion and that matter is really made up of tiny components and they in turn are made up of even smaller bits, hence a chair is wood is fibre is molecules is atoms is protons, electrons and neutrons are quarks and nobody knows what, if anything, they are made of. But time as we experience it is projected up and down in scale (to the whole universe, hence 13 billion year age, and down to quarks or, at least, Planck's time/interval). This is like looking for a chair at the atomic scale. There are components of time, we know that (or should know that) because there are plenty of conditions where time does not exist *as we know it*, for instance at the speed of light, at the event horizon of a black hole, and in the superposition of states. The "Time" we experience is not the "real" time. We experience a projection of "real" time onto the 3 dimensions of space. This plus a misunderstood gravity equation explains why relativity measurements are usually validated for near-earth phenomena, but objects far away, such as galaxies, experience weird effects not covered by Relativity directly (error). I think Time, real time, must be objective with regards to us. Objective: The Universe is real. Objective: "Reality" is objective cosmically. Objective: The Universe is a sub-set of Reality(likely) or else equal to Reality (unlikely). If reality is Objective, then a measure of Reality ought to be Objective, even if said reality is infinite. There is no reference frame in reality where my hand appears to have infinite mass. That's ridiculous. Relativity predicts if you are far enough away or moving at the speed of a proton in a collider, a stationary person's hand would have nigh-infinite mass. That is an absurdity. For example, in Relativity, a planet or Star which somehow obtains a very high velocity, such as 0.9999999999999... (18 to 24 digitss) would have a mass of an entire Galaxy). Relativity of mass around Black Holes accretion disks ought to produce "Magic Mass" of billions, even trillions of stellar masses, but it doesn't. "but the theory works in a collider, or with mirrors and lasers, etc." Maybe, or maybe something else in the environment biases local measurements in the same way, but the theory itself is somehow wrong? If protons are falling into a Black Hole, but the protons are moving arbitrarily close to the Speed of Light, then they aren't actually protons, they are an un-predicted smaller particle 12 orders of magnitude less massive than they appear to be...and you observe them as a "proton" due to relative mass (if relative mass exists). See how ridiculous relativity becomes? You can't trust ANY distant observation. Anyway, if Mass is Relative, then you can't actually use apparent motion, including orbits, to measure the mass of distant planets and stars. (Planetary Clock thought experiment). You will observe complete wrong values, and without an objective measurement and without a object oriented local measurement (with respect to that object) you have no way of knowing the properties of that distant object in Relativity. Spectra analysis can help, but that isn't guaranteed to be accurate, because you are supposedly assuming the passage of time changed with velocity or distance(inflation theory). if the passage of time changed then the shape of spectra may have changed. You know nothing about a distant object except the spectra it appears to emitt and if it appears to have any cyclical behavior. You think you can measure it's distance using cepheids, but you don't know what a "there local" cepheid is...because you can't tell it's mass. Two stars are moving at different velocities with respect to Earth, 0.25c and 0.5c. They have the same apparent mass. They are chemically identical in terms of percent composition. The consequences of this is that the stars have different numbers of atoms. If they have different numbers of atoms, then they are not at the identical stage of stellar evolution, even if we measure them to have the same mass. Relativity predicts a 6 percent mass discrepancy for one of the stars, and a 25 percent discrepancy for the other. This is absurd. A 6 percent mass change is far more than the entire amount of mass the Sun has burned away in it's entire lifetime, as the Sun has apparently never lost even 1 percent, though getting close. If you changed the Sun's mass by 6 percent it would de-orbit the planets and it would burn incredibly much hotter, whether or not you changed the atom count. See how "Relative Mass" becomes absolutely absurd? If you change the number of atoms by 6 percent or 25 percent, but leave the mass the same, what happens? Extreme burning and then Gravitational collapse to a denser state (neutron star or iron/heavy metal star). The nuclear bonds aren't strong enough to support it. If Relativity is true, then Measurements past the "Local Group" are basically useless, and some measurements within the Local Group are basically useless. You can use perspective tricks to say one galaxy is in front of the other, and then use spectra as a reference to those, but even that becomes untrustworthy for distant objects. How massive is that star? I don't know, measure the orbit of a planet. Well that's a problem, I can't trust the time measurement because it's moving, and I can't trust the time measurement because mass changes time. Therefore I can't measure mass, because time changes velocity, and velocity changes mass. There are PhD level physicists with major groups, including NASA and even Oxford university which have shown that in Relativity your light horizon problem arises which causes information in one part of the universe to be permanently inaccessible to other parts of the universe. If this is the case, then information about all distant objects, not just those "beyond the light horizon" are continually lost to us as observers. This means that Relativity theory itself predicts that the information is lost, which means relativity itself predicts that we can't actually know the mass and properties of objects of unknown distance, speed, and mass. You cannot measure it properly without an objective reference, and the theory denies the existence of an objective reference. The measurements made in Einstein's thought experiments are not "measurements" they are assumptions and "givens". Two Einsteins travel around on two different trains for 10 years and then get off. Well, how many orbits of the Sun did each Einstein observe? I figure they are on the same Earth as me, so they must observe the same number of solar orbits. So then if they are experiencing time differently one did what? Observe the mass of the Sun and Planets change by 50% because they were moving 88% of the speed of light? That is an oversight made by Einstein and the entire scientific community, which when examined objectively clearly disproves at least one postulate or claim of Relativity. There is actually no geometrically consistent solution to the thought experiment he constructed. If you insert a third observer and think about what the Sun would be doing. "Assume we have two point masses in a closed isolated system. Ignore friction, gravity, air resistance, etc, etc." You may laugh, but that is how absurdly artificial relativity thought experiments are when discussed by physicists. Then they try to apply the absurd conclusions obtained from such an absurd thought experiment to an object which is of unknown origin at an unknown distance and unknown age an velocity, to try to determine those properties using a formula with an unknown number of unknowns. It is easy to construct VERY REALISTIC thought experiments which logically disprove Relativity. It is not easy to construct real world experiments because we need a "sub-luminal" speed space ship to actually prove by multi-reference frame observation that some of the predictions are wrong. We can prove they are wrong in the geometric sense through logic, because they are not consistent and produce paradoxes which never actually happen in reality, such as two peole on the the Earth in imaginary trains observing the Sun having 50% different masses just because one traveled east at 0.2C and the other travelled west at 0.3C. Heck, forget marking speed by "C" because that's a self-referencial definition of the speed of light, and of speed itself, but we are so used to doing it that we don't even question it. How do you prove or disprove that hte speed of light is literally always equal to an exact, finite "ultimate speed" of the universe which never changes? It's not even a good axiom, because it doesn't appear to be necessary. See, an axiom is something which is usually taken to be so obvious that it is assumed to be true until disproven. Unfortunately some things must be taken as axioms in order to understand anything else at all. All of science is based on the notion that hte laws are the same for all space and time. There is really no good reason for that to be true, but if we don't make the assumption that it is true, or at least close to true, then we can't understand anything else with respect to anything. You can make all sorts of fictional vector spaces work on paper or in a computer if you ignore enough realistic variables and ignore enough realistic points of observation. Sweet Lord, man...do you know there is a 1000 character limit for a reason?